Our services include: Free estimates, drawing and design capabilities, delivery of building materials, equipment rental (insulation blower, sheetrock jacks, pneumatic tools, compressors, etc. ), and custom metal bending on our in-house brake. Also, be sure to ask us about our custom garden/storage sheds. We can make and deliver them to you in just about any shape and size. Let us work with you on your future projects to help make your dreams become reality! We have many years of experience designing and building additions that increase the value of your home and more importantly, make your existing home more functional. If you like the location of your home and it is solid, remodeling makes sense. Ever wonder where you will put that new boat? How about that new garden tractor? We have the right sized storage building for you. Our buildings are engineered and built with certified lumber, poles, and trusses. We do shell packages, set your building up for insulation or design them completely finished. Custom built sheds to meet your needs! Can’t find a builder for your new store? We supply commercial steel buildings with wood framing or all steel buildings. We have worked on hardware stores, lumberyards, fire halls, offices, and manufacturing facilities. Old windows simply can’t perform to today’s energy-efficient standards. Money sails away on drafty construction. You spend too much time cleaning and painting them. You cover up the condensation with curtains, probably those “insulated” beauties that try to do what your windows should do alone-block the winter cold and summer heat. With replacement windows from Thermo-Tech, you can expect more: more energy savings; more time; more comfort. 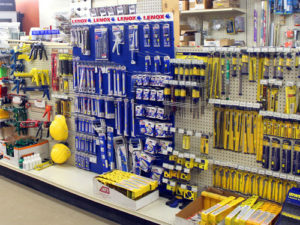 Hardware and tools for your project. Let us take your ideas and put them on paper. We take pride in “curb appeal” of your home and it will be an asset to your neighborhood which will increase the value at resale. The Elbow Lake area has many quality licensed, bonded and insured contractors. These contractors have many years of experience. Whether you want a concrete slab poured, a deck, or a complete home, the local contractors can meet your expectations. Please contact us.